And so, back to life and living it. 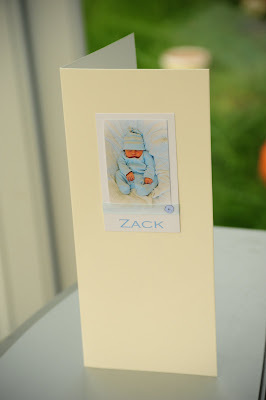 I made and sent some lovely (even if I do say so myself) birth notices with combined thank yous. Much easier than doing both seperate. I have made a start on a set of tea towels to be gifted to my Nan for Christmas. The fact that I'm only on 'Monday' and there are 7 days in a week is something I'm choosing to ignore. 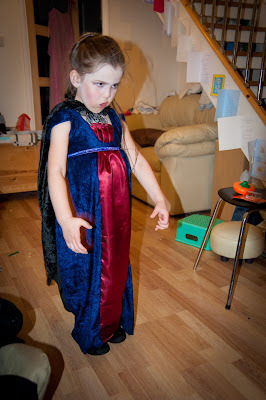 I made a very quick (Saturday 30th October 9pm) Halloween costume for the small person. 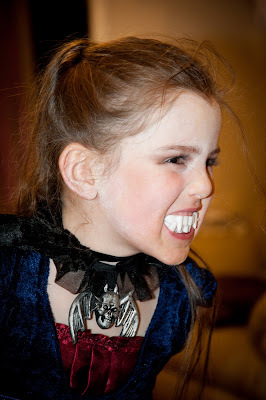 She was a very scary vampire (who desperately needed a trip to the dentist for some braces!). 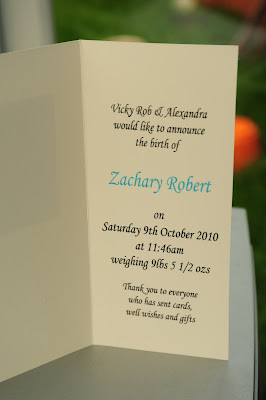 Zack reused an old baygrow of Alexandra's. He was the cutest little Devil Trick or Treating for miles :D.
We invited Alexandra's friend, Catrin the Pirate to visit for Halloween. 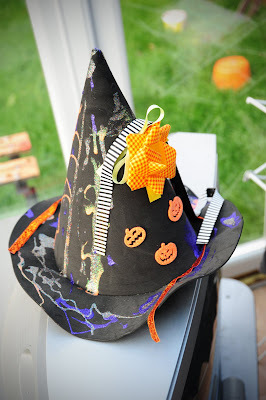 They decorated witches hats, ate pizza and garlic bread and some of my home made pumpkin soup, all whilst Winnie the Pooh's Heffalump Halloween played in the background. Then we all went trick or treating. Trick or Treating isn't always very well received over here in the UK, so we usually ask a few houses earlier in the week if they mind us trick or treating their house. Mostly family, a few friendly neighbours, then if we see any other houses thathave pumpkins or decorations outside as we pass, we call on them too. 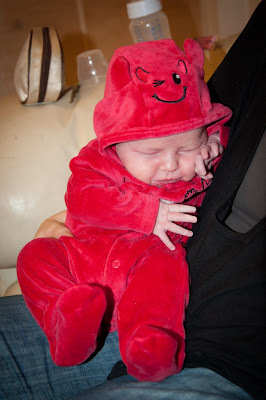 We had a lovely time and Alexandra will require no more sweets buying for her until Halloween 2012! We also had a short trip to Glasgow whilst Mr Bogert was on paternity leave. He had a photography course to attend (you can see more about it on his blog, here), so he took us with him. We had a lovely big room and the small person was super excited by the double sofa bed that she slept in. Highlight of the trip (apart from spending time with my favourite people and not have to think about housework or cooking)? Across the road from our hotel window was a fabric store called "Mandors". I am in love! There isn't a single fabric I could think of that they don't have. Not only would they have the fabric, they'd have it in about 6 different colours or more! Why does Glasgow have to be so far away!? Chances of convincing Mr Bogert to make a 5 hour journey for a fabric shopping trip? Not going to happen no matter how much he claims to love me. I still haven't managed to return to toddler group. 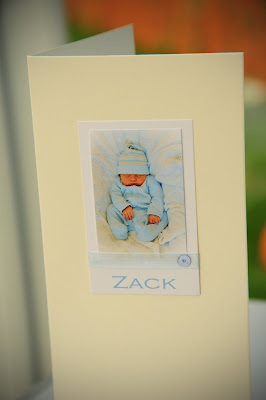 I took 4 weeks away and intended to return today, but the small person wasn't very well in the night. We'll try again next week! I have still been preparing crafts for them though. 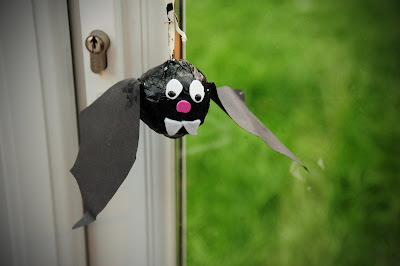 For halloween they made bunjee bats and pumpkin masks. 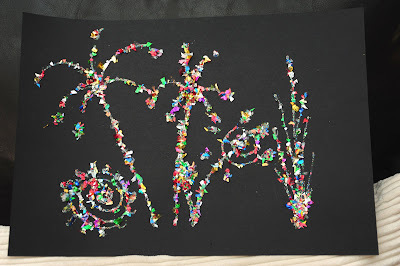 For Bonfire night they made glitter and glue firework pictures. Today they have been making poppies for remembrance day. I'm also feeling quite proud of myself that I managed to complete and hand in my first assignment on my course. I don't think my mark will be fantastic (hoping it's passable though) but just the action of getting on with it and having it complete makes me feel "yes, I can do this". You put me to shame young lady, still managing to blog...I must update mine, I must! Much love to you and the Wishes clan.